This thin novel by American-based British writer Diana Durham is weighty with ideas – like narrow uprights supporting the monumental capstone of a cromlech. 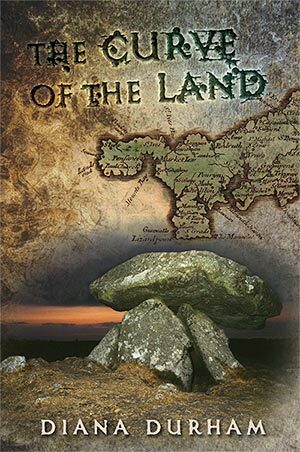 It charts a contemporary megalithic odyssey of Britain, with many prehistoric sites featured, and as such should appeal to anyone of the pagan persuasion. The framing narrative is a group tour of sacred sites led by the charismatic ‘leading authority’ on such places, Richard Lamb. He is a guru with feet of clay, as Jessica discovers – the viewpoint character whose journey we follow. An environmental campaigner suffering from burn-out, she finds her life imploding – chiefly the relationship with her eco-photographer boyfriend, Paul, who bears the brunt of her perpetual disgruntlement. On the verge of splitting up, she jumps aboard Richard’s ‘magical mystery tour’, in hope of some kind of spiritual experience involving earth-lights – the anti-venom to her partner Paul’s apparent ‘rationalism’. Their conflict provides the dialectic of the narrative: the ecological vs the spiritual; the mundane vs the magical world; ‘Martian’ men vs ‘Venusian’ women – all of which prove to be false dichotomies. Yet there are many bumpy roads to go before then. Durham convincingly captures the tour-group dynamic with a sharply-observed cast of (mainly) New Age seekers. A couple of sceptical journalists are thrown in for good measure. Durham is particularly good at capturing the pervasive credulity, snobbery and brinkmanship endemic in such circles. The women (and the demographic is mainly female aboard this Earth Mysteries tour) vie for the attention of the unlikely Alpha male, Lamb, who turns out to be seedier than his refined façade. As perhaps inevitably happens in such situations, the group’s Shadow emerges as the earth-light seekers find themselves experiencing lust, jealousy, anger and despair. Each site catalyses the escalating situation – providing a mirror for their projections and expectations, fears and concerns. Durham evokes the genius loci of each site vividly and Lamb’s commentary provides an expositional device for weaving in the archaeology, folklore, and John Michel-like mystical speculation. What keeps the narrative grounded is an ecological awareness, which provides the background ‘threat’ throughout the story – this is epitomised in the threat to a grove of ancient oaks in Cornwall by a supermarket development. The plot-lines converge on this crunch-point, in a rather condensed and melodramatic denouement. Jessica, who proves to be a querulous, contrary and – dare I say it – irrational protagonist, experiences an epiphany which motivates her to act. Yet this is too little, too late – for the majority of the novel she comes across as a rather solipsistic, unsympathetic character. Paul, who is ostensibly, the ‘enemy’, (a man, and therefore, by default, insensitive, gadget-obsessed and controlling it would appear) turns out to be more sympathetic. Fortunately, most of the female characters are flawed too and nobody really ‘wins’ in this war of the sexes. In a way, the humans’ behaviour could be seen as the fey flickering of earthlights caused by the stress the Earth is being placed under – acting out the pain of Mother Earth. This underlying ecological suffering, and the helplessness it inculcates, is the book’s most serious message, which redeems it from being a mere New Age holiday read. Yet it has much to satisfy the lovers of esoteric fiction – being redolent of the novels of Dion Fortune, and, indeed, my own novel, The Long Woman (Awen, 2004). It shows a deep familiarity and love of the ancient Isles of Britain, and makes for an engaging read – especially in situ. Recommended. This entry was posted in British Literature, Literary Criticism, Literature, New authors, Recommended reads, Reviews and tagged Ancient Britain, Book Review, Britain, British fiction, British Literature, British Novel, Cornwall, Cromlech, Curve of the Land, Diana Durham, Dion Fortune, Durham, Earth Mysteries, Ecology, Environment, environmentalism, fiction, Kevan Manwaring, Megalith, novel, review, Sacred Earth, Skylight Press, standing stones, Stone Henge. Bookmark the permalink.